It seems that almost every day I check the news a new issue fans the diplomatic flames around the Pacific. As the United States and China continue to redistribute the global economy, the competition for influence in the Pacific has deepened. Mongolia has recently reached the forefront of this competition. However, Mongolia may prove to be just another part of a larger pattern of U.S. regional involvement that China suspects is a strategy to encircle its borders. The United States recently reached deals throughout East Asia in a bid to expand its political and military involvement in the region. In early April, Japan announced that the United States would send two additional Aegis missile-equipped ships to Japan in order to bolster its naval presence. A few days later, the United States announced a deal with the Philippines that would expand naval cooperation between the two countries. This comes after a year of deal-making in which it offered the Philippines access to American military structures and also sold multiple vessels to the Philippine Coast Guard. Taiwan, formally the Republic of China, periodically receives arms from the United States. While the United States is obligated by law to protect Taiwan, China still claims that Taiwan is a breakaway province awaiting reunification. United States Secretary of Defense Chuck Hagel recently warned China against a “Crimea style” annexation in the Asia-Pacific, drawing a connection between Russia’s recent annexation of the Crimean peninsula from the Ukraine and China’s various territorial disputes with its neighbors. The unusually tough warnings from one of the United States’ top military commanders could be an attempt to raise, at least in the minds of Chinese leaders, the costs Beijing faces in settling regional disputes by force. Given Hagel’s comments, America’s strategy of sanctioning Russia for annexing Crimea seems to be a type of warning to China should it attempt to use force in the Pacific. It seems to be an increasingly urgent priority for the United States to deter China from wielding a military advantage over its neighbors, which China has been gaining due to years of double digit military budget increases. China has been wary of U.S. involvement in the region and accuses the United States of taking advantage of territorial disputes. Despite American pressure, China refuses to discuss its territorial claims in regional forums, preferring instead to settle disputes on a one-on-one basis with relevant countries. China sees American involvement in territorial negotiations as an omen of what is to come. China’s ambassador to the United States, Cui Tiankai, recently warned Washington against any attempt to establish an “Asian NATO.” The ambassador’s warnings demonstrate China’s increasing unease with the growth of Southeast Asian opposition to its regional influence and the possibility that opposition presents for American exploitation. The expanding role of the United States in Asia makes the prospect of Mongolia slipping into the American sphere of influence a particular concern to Beijing. The Inner Mongolia Autonomous Region, which is a part of China, is home to a large Mongolian minority and American influence could, even inadvertently, stir conflict. Ethnic tensions between Inner Mongolia’s majority Han population and the Mongol minority have flared up recently and China remains wary of the fact that the Mongolian minority ethnic group possesses a nation-state directly north of its border. If the United States were to sell military equipment to Mongolia or promise to come to its defense, an emboldened Mongolia could lead to greater ethnic tension in Inner Mongolia and further encirclement of China. In 2011, China’s Foreign Ministry spokeswoman Jiang Yu warned “for those overseas trying to play up this incident for ulterior motives, we feel that it would be impossible for them to succeed.” Such a rare accusation of foreign responsibility indicates the level of attention Beijing affords the ethnic issue in Inner Mongolia. 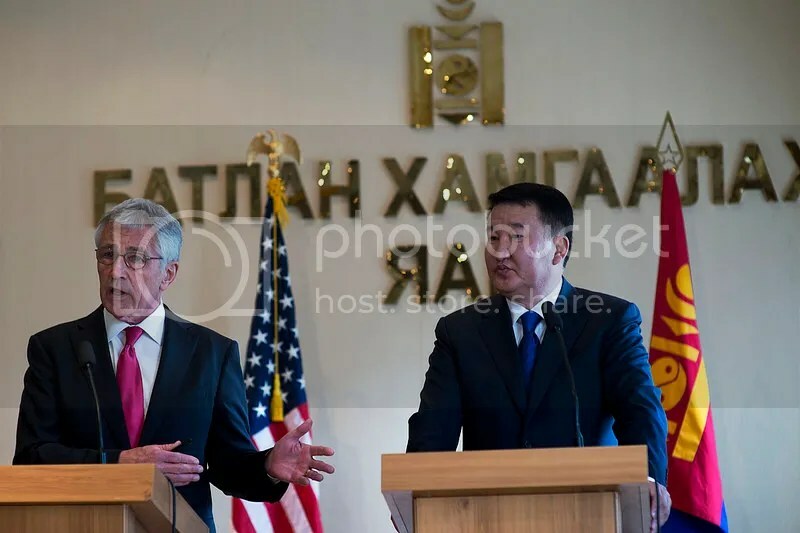 Earlier this month, Secretary Hagel visited Mongolia and endorsed stronger military ties between the two countries. Hagel stated that military relations are “important as part of the American rebalance to the Asia-Pacific region,” a statement sure to send chills down the spines of Chinese diplomats nervous about the possibility of encirclement by the United States. With American influence already present in places like Australia, South Korea, Japan, Taiwan, the Philippines and increasingly the rest of Southeast Asia, U.S. overtures to Mongolia threaten to place China within a wall of American allies. As China’s economic rise brings quickly expanding military power, neighboring countries like Mongolia will continue to seek counterbalances to Chinese influence. Unless Chinese diplomats are able to chart a fundamentally new course in regional politics, the United States might find containing China relatively easy to accomplish.